Newfoundland dogs, affectionately called “Newfs” or “Newfies” are large working dogs. They are so named because they were originally bred and used as a working dog for fishermen in the Dominion of Newfoundland. Newfoundland breed dogs are known as “the gentle giant” for their giant size, calm dispositions, intelligence, tremendous strength and loyalty to their owners. Their muscular build, thick water-resistant double coat, webbed feet, and innate swimming abilities help them to excel at water rescue and lifesaving. One famous Newfoundland dog named “Hairy Man” helped his owner, her father and brother rescue 163 people from a shipwreck in 1828. Newfoundland dogs even have a down-and-out swimming motion instead of an ordinary dog paddle. Those from Missouri know of another famous Newfoundland dog: ” Seaman”, who accompanied American explorers Lewis and Clark. The Newfoundland dog breed is known for its even temperament and stoic nature. It is for this reason that this breed is known as “the gentle giant”. They are also gentle with children and good with other animals, but of course their giant size must be considered. 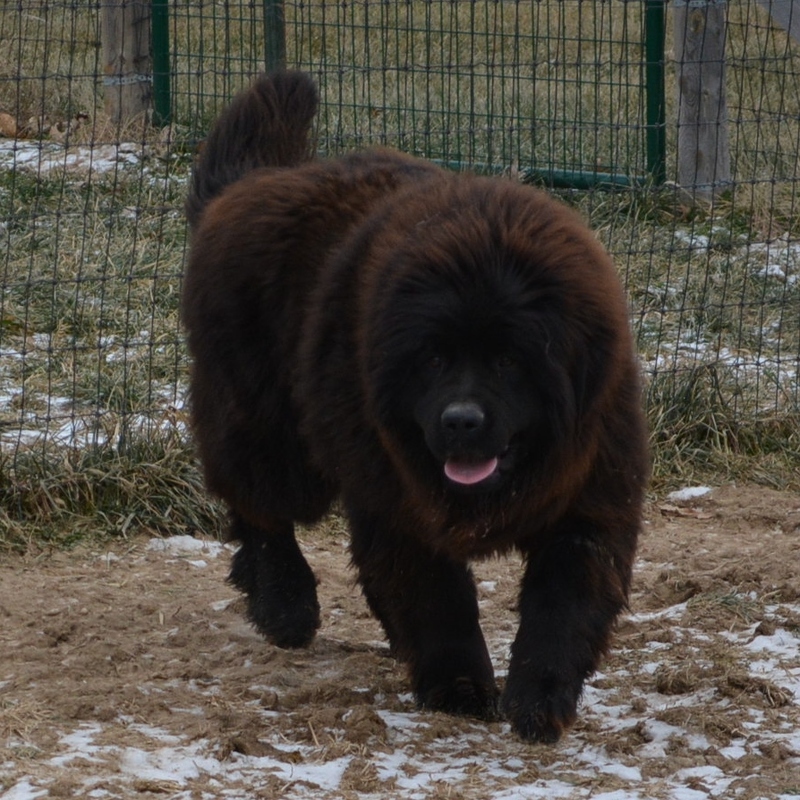 Newfoundlands come in a variety of colors, including black, gray, brown or white and black (called Landseer). The Newfoundland shares many traits with other dogs, such as the St. Bernard and English mastiff, including stout legs, massive heads with very broad snouts, a thick bull neck, and a very sturdy bone structure. Newfoundlands also share many characteristics of mountain dog breeds such as the Great Pyrenees, which are also bred by Harvest Acres. Not surprisingly, the Newfoundland breed originated in Newfoundland (now part of Canada). The mastiff characteristics of the Newfoundland are likely a result of breeding with Portuguese Mastiffs brought to the island by fishermen beginning in the 16th century. By 1610, the distinct physical characteristics and mental attributes had been established in the Newfoundland breed. In the early 1880s, travelers to Newfoundland described two main types of working dog. What became known as the Greater Newfoundland was heavily built, large with a longish coat. The smaller breed was known as the Lesser Newfoundland, or St. John’s dog, which became the founding breed of modern retrievers. Both the Greater and Lesser Newfoundland dogs were used as pull fish nets and the Greater Newfoundland dogs could haul carts and other equipment. Over the years, the Newfoundland breed was used increasingly for water rescue in countries such as Canada and Russia.